Showing Up in Search Engine Result Pages Can Be as Tricky as a Circus Act! Do you remember the time before widespread usage of the internet when a business owner would use the phone book to be seen by their community and markets? The choices were a bold-print listing in the White Pages or either a business-card formatted ad, a partial-page or a full-page advertisement in the Yellow Pages, and often both were used. The choices today, however, are not so simple and direct. In the digital world there are hundreds of search engines (“phone book” providers) involved and each of these search engines have their own set of rules governing how to communicate to them and how they, in turn, communicate to your consumer. Now most are familiar with these two search engines: Google and Microsoft's Bing/Yahoo. However, few people know that both of these giants rely on hundreds of smaller search engines and indexing systems for the information they deliver in their search engine result pages (SERPs). As certified partners with key business management and marketing services, MarketFirstUSA provides local companies with the technical know-how and marketing expertise to both get listed and show up in SERPs. 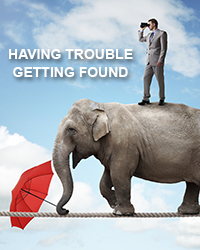 Call (847) 656-5365 to talk to a MarketFirstUSA search specialist and get a free evaluation of your search results. Can Be as Tricky as a Circus Act! Now most are familiar with these two search engines: Google and Microsoft's Bing/Yahoo. However, few people know that both of these giants rely on hundreds of smaller search engines and indexing data bases for the information they deliver in their search engine result pages (SERPs).